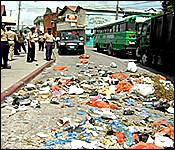 And later on we'll tell you about another murder - this one of an 18 year old male in Orange Walk, but first to the story of the day: BML workers throwing bags of garbage on the street in front of City Hall. First, the background: last week we told you about the evolving crisis the Belize City Council has been facing with Belize Maintenance Limited. We say crisis because the city owes BML the equivalent of 19 weeks of arrears. The city says it will not renew the contract when it expires in January 2015. 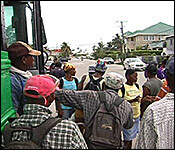 That's the future, but in the here and now, BML's workers say that the city's "haad pay" tactics are causing them to lose their jobs. This morning that led to some dramatic scenery on the city streets. 7 news was there. This was the scene this morning in front of City hall as around 50 angry BML workers dumped bags of garbage in front of the building. They left filth strewn across North Front Street as their show of protest forcing the closure of this major thoroughfare, and forcing the diversion of during the regular morning rush. That dramatic and defiant demonstration was the culmination of a street side press conference which started in front of BML's office on Baymen Avenue at about 9 this morning. That is where the workers vented on Mayor Darrel Bradley. They said they are losing their jobs because he hasn't paid their employer in 19 weeks. "This is what the workers from BML gave me. They say this is their breakfast in the morning because the money that they have they had to leave it at home for children because they come out at 6 in the morning - it's a shame." 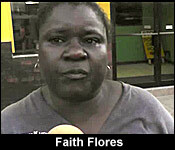 "We can't go home and tell our children that we don't have anything to give them to eat. every day we wake up we have to wonder what we will give our children to eat. When we don't have it they cry. What the mayor wants us to do, go thief, go rob people, go burn down some house- what does he wants us to do? Come on, we are taking lick out here. Watch what I am eating; biscuit and sausage. I can't even get water to wash down the biscuit. The biscuit is choking me." After half hour, they loaded up into waiting buses for a ride to City Hall where they planned to take direct action. "Majority of us are single parent. Without this job what will become of us? We will have to end off stealing, we have to end off robbing and kill which is not fair." "Why should we happy? Let me tell you something that needs to happen; the mayor needs to come to the table and negotiate with these people. You can't say you owe me and don't tell me when you will pay me and why you cannot pay me. Come to the people here - tell me Mr. Mayor because I know you know." "We know our jobs are in jeopardy, but we need to eat and we need to work. The mayor is just a greedy dog." "We are tired of eating chicken ramen and chicken parts. We are tired of eating everything. We want back our job." 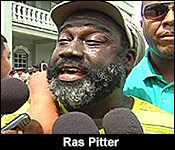 One vocal sympathizer is Ras Pitter, a stevedore who finds common cause with these workers. "I am in full support of BML workers. These people are foundation. These are people before this mayor and before a lot of mayors. They are from original City Council days and through the privatization they remain, so I am full support. The mayor is human being just like all these people out here. Have a little conscience rasta, have some conscience towards these people here and sit down with these people and reason out. Have that and don't act arrogant my brother. All of us in the same age range. Let us deal with one another like a man mayor. I am in full support for you to pay attention to these people here." But while Pitter supported them; the police did not. The protest had no permit, and the police seemed to have no advance intelligence of the protest, so they appeared to have been caught unprepared and stood by as the street cleaners made a mess on the street. 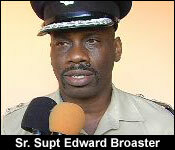 Eventually, Senior Superintendent Edward Broaster took charge. 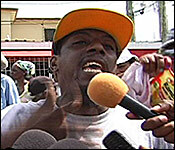 "What you all are doing here is an illegal gathering here and you all are littering the street. Just because you all are fighting for your rights means that you will break the law doing so." "We are not breaking the law." "You all are breaking the law. You all are doing an illegal gathering and littering the street, so I am asking you all to pick up this garbage and disperse." When the batons were brought out, the street cleaners left, leaving the garbage behind. But the police, anticipating this, set up their own dramatic road block on Queen Street, intercepting the vehicles and arresting 45 protesters. 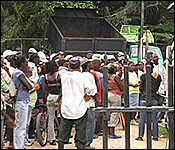 "I've explain to the workers that we do not want them to get hurt so we will disperse, but we are leaving the garbage. 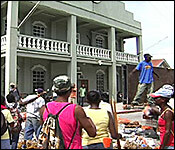 We will disperse and we will come back tomorrow with the proper permit." "I'll be very honest with you. We are not law breakers, if it takes us to go get a permit every single day that is what we are going to do. That is what we are prepared to do because we don't want what happen here today happens again." "But why didn't you do that for today?" "It was a spur moment thing, you understand. The people are fighting for their money, they are frustrated." But the frustrations do not stop there as both the City Council and BML seem to have two very different takes on the current impasse. 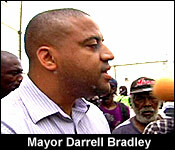 According to BML'S Operations Manager, Mitchell Danderson, it has been almost a year since mayor Bradley has spoken to BML. "As far as we are concern he didn't make any contact with Mr. Ellis, the manager of the company. He hasn't been in communication with the management any at all. We hope that the mayor will show some respect, some dignity and come and say Mr. Ellis, Mr. BML let us sit and talk but that hasn't happen over a year. Mr. Ellis has made different requests to meet with him and that has never happen." "What's the next step for the company if this doesn't work out?" "If this doesn't work out - the last thing I said is to send people home if the company cannot bear it anymore that is what we will have to do until the mayor sit and have a conversation with Mr. Ellis." "I am telling you that in much of the dispute and I will concede and accept this that the city council is at fault, we are at fault and I am the head of the city and I accept responsibility for the fact that BML has not been paid for a substantial period of time." "I am accepting that because as a leader that's what you do. It doesn't makes me feel good to tell anybody in the public that we have outstanding arrears for so long that's why I am working every single day to pay these people off - to find ways that we are going to pay these people off. Why must I pay $78,000 per week to chop in front of your yard? That is not public. What you can do and what you said and I appreciate your question, but we are doing a lot of analysis in terms of justifying and reprioritizing what do at city council to ensure that when we spend public funds we can say that we are spending public funds on what is considered public." "One of the things that I want you to appreciate is when we look at the management of the city, there are different priorities, we are placing a significant amount of priorities streets, infrastructures, in upgrades to parks in other areas. A significant part of the attention, notwithstanding that we place a lot of priorities in those areas have been these sanitation contracts. The reality of that is just because these things are so significant in cost. It takes a lot out of us to pay a $78,000 bill per week together with a $51,000 bill per week together with salary payments of $189,000 every two weeks. That right there, those 3 things takes up about 80% of what the city council takes in. It's just too much." "When you are dealing with things like sanitation, I have maintained that we could provide the city that service far cheaper. I do not believe that BML has 100 persons on the ground. I am not talking about supervisors, I am not talking about management, I am not talking about the owner; I am talking about the people who go on the ground picking up the garbage, cutting the grass." "They say they have 170 workers." "They don't have a hundred people doing that on the ground. They don't have those people and they are not paying those people $200 a week. They don't make $200 a week. You need to take care of your own business just as how the mayor needs to take care of the city's business and analyze then from August now to January, what am I going to do knowing that this contract - I don't even know if BML has other, maybe they can stay - I don't know. That's their business, that's not my business. I have to worry about paying them. I have to worry about paying our staff. I have to worry about paying our streets. They have to then deal with their own employees - like that's their company." "How can they pay their employees when you are not paying them?" "We are paying them and we are going to pay them." 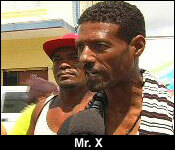 "Do you have any intentions to speak with Mr. Ellis or management of BML?" "I've always spoken to them." "He have said that its been months that you have spoken to him." "When was the last time you've spoken to them?" "Sir, can you say when it is that the council will be making another payment?" "I cannot say exactly. Those people, while I am sympathetic to them are not city council employees. 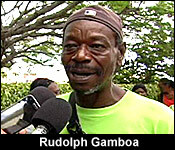 You work for a company that has a contract with the Belize City Council. It's a tenure contract, that contract is coming to an end." "There are littering penalties right now. I can't recall if one person has been arrested." "We've persecuted a lot of people on that. That's part of our strategy." "If you can't currently enforce that legislation, how will you....?" "We are enforcing that legislation." "Obviously I dint see it because when you go around...."
"You don't go to court Geovannie." "How many people? Give us a statistic?" 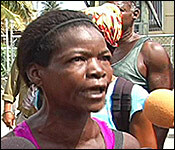 "I am not the sanitation person, but every month I think that we persecute more than 30 people for that. I can't tell you if those persecutions are successful because that is handle by a certain department of this operation and I know that people write in. The fines for business is $2,000, for an individual its $500. Those are serious fines and we've persecuted offenses under that." "All I am saying is that coming closer to the January 2015 deadline, I expect that there will be increase contentions and frustrations because you are going from ne system where you are paying and exorbitant amount of money to one supplier to a system where you don't have to do that, so I understand that the employees are concern. I would be concern likewise. I understand that the company is concern because they have been in a sense bleeding us for 10 years and now that that is coming to an end - that gravy train is coming to an end they are holding up their hands and saying what." And while there are aspersions to the contrary, the mayor today publicly restated that when the contract lapses, the job of cleaning the city streets will revert to the city council. Last night, we gave you an extensive look at the protest from 50 angry BML workers who threw bags of garbage in front of City Hall. That's after things came to a head because the Council owes their employer for 19 weeks of services or almost 1.48 million dollars. There is no timeline on when the company will be paid, and this has spilt over to the workers because BML can't afford to keep paying them. Those workers raged, vented at the Mayor, and made a powerful statement with their pile of garbage spread on the street, but they also paid a price for it. First, they were in lockdown for several hours, then they were charged, and then, they spent an entire day at court waiting to be arraigned. "Ma'am this is first time you have been locked up?" "What message you have to send right now to the Mayor?" "All I got to tell them that this is not a political thing. This is all about us and our children; a job." "You feel that this could have been dealt with much differently?" 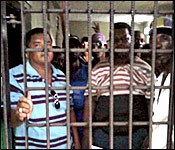 "This could have been dealt with much better than this, than to have us out here punishing - locking up us in a cell. I caught asthma in there and they left me like that. There are [#%!] everywhere in there and got all us women in there to punish like this. One woman collapse in there and they took her out when he already fell. Hello, what goes around, comes around." That was followed this morning, with a summons of all of those 40+ employees who ended up being charged for yesterday's protest. All around Treasury Lane, the forty-plus BML workers who were charged last night, paced back and forth or stood around, waiting for Magistrates Court Police to call them in for their arraignment. After about an hour or so, one of the lead employees emerged with the document that would need for the hearing. Their attorney worked on getting everything together, so that the hearing would be as streamlined as possible. But about half hour later, she emerged from Court's Office, with bad news. "I have an update for you all, the reason they are taking so long is because they don't have a courtroom big enough to put everybody, one and two, the Police, advised by somebody in their wisdom, had advised that instead of putting everybody on one charge sheet, they will split it up. So right now the Police is at Queen Street Police Station preparing new charge sheets to give you all. So we will be out here a long time because they have 41 charge sheets to prepare. Then they will come and serve it to you again, then they will have to lodge it, then we will go to court and even the bail process will take long. So if you all have something to do, children to take care of, quickly do it and come back because this will be all day. But you need to be here to be charged and we need to make sure that the persons who will bail you are here." So, it was it a marathon waiting session for these workers, who weren't the least bit pleased with the state for bringing charges against them for simply voicing their frustrations. "They charge so many women and men yesterday to throw dirt, nobody did throw dirt on the street yesterday, it's the truck that did that. They charge 48 of us, they didn't charge me, because I am not a fool. Why does the Mayor doesn't pay the boss?" "I was ill-treated there, I was sick with asthma and they left us there in that cell, 22 of us. No lights, no fan, no nothing." A few of them feel especially betrayed by the actions of the Mayor because they were once a part of the City Hall before he entered office. "I am from city council, from I am sweeping streets, we even help dig city council and here I am still standing working for them to keep this city clean." "What happen yesterday? Did you regret it?" "I don't regret at all." "I do 5 years at city council. I clean drain, I dig drain, I clean the street and I never been there yet. 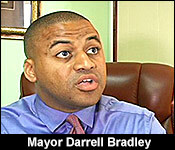 But this year is the worst year we been through with Darrell Bradley. Why don't he pay the boss so the boss can pay us? I don't like the situation that he is doing to us because we are poor people. Every time a situation comes up and this matter comes up, its poor people that suffers. Why does it have to be us that suffers? Right now they don't want to give the boss back the contract, because they already have someone else there to take over the contract." "We did not just come here, we have been here for a long time for them to treat us like this. The boss doesn't want to let go any of us, but if he cannot pay us... some of us are not working right now. 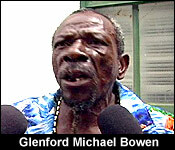 Some of us have to sign and go home because he doesn't have any money to pay us." "When it was the city council, everything was running nice. This is the roughest time we ever meet under this government. Under Zanaida it wasn't like this too. They use to threaten us they won't give us this and that, but Zanaida Moya still give it to us because she is woman with feelings too." "What happen to us? Every time it's only the streets they will deal with? We don't even have a sensible house to live in to show for the amount of years that we work. We don't even have anything sensible to show for the years that we work and they want to come and cut us short? What the hell is wrong with them? I want they come and pay our boss. All what we are asking for is to pay our boss." "Be real to us. Pay the boss so he could pay us." "We have to eat. School is opening up soon. I have 3 children going to school right now and I can't pay school fees yet." "We are old workers, we are all black people fighting for survival. So if we can't survive what will we look on." Mayor Darrell Bradley had lawyer business at the Court House today, and when the media asked him for an interview, he obliged. The angry BML workers took the opportunity to corner him. "We can do the interview at city hall if you still want the interview." When the Mayor left the court house that close to midday, the workers waited for another 3 hours before the Magistrate's Court could accommodate them. In total, 41 were jointly charged with taking part in an unlawful meeting under the Public Meeting and Public Procession Act. "We waited all morning. We are here from 9am. At 10am I was informed that they can't find a courtroom big enough and that the persecution was advised to split the charges, so we stayed here until midday, I kept hoping that we would have started some of them since they were splitting the charges. I was told at that point that they had done 15 charge sheets, so I said can we start the 15, but then the inspector told me no, we have to wait until two o' clock to come back at two and we will do all 41. At two o'clock I called again and they said that they have only completed 22 charge sheets, I said no problem we will do the 22. However, when we came and they started the arraignment process I realized they never brought new charge sheets, they did new court books which are different. My clients cannot be charged under the old charge sheet if they want to split up the charges, if they do the old charge sheet everybody has to be in the same room, but that's not what they want to do. Somewhere along the line they faulted and did not create the new charge sheets or they created it and left it at the police station so we are here waiting for it. Right now all the gentlemen and women are being placed in different court rooms so we have Anthony Sylvester assisting and Kareem Musa assisting and myself because I can't be in three courtrooms at the same time. But fortunately we were able to stand down all the matters right now because we are waiting for the charge sheets to arrive." "If they don't arrive then the people are on police bail and they will have to come back tomorrow, but for now we know that 22 will be process and the remainder will have to come tomorrow. So it's going to be a third day of this circus that's going on because that's what it has amounted to now." "Did they give you a reason for the delay or what causing the problem?" "Honestly, the only explanation I have is that the police are overworked and I could appreciate it because after spending the entire day at the police station yesterday and seeing all the paperwork that these police officers have to put in to get a charge sheet prepared - I sympathized with them and amidst all of that they have to be doing every other work assigned to them. So it's very difficult for them and it's not making excuse for them, its dealing with the reality that we have limited resources and the limited resources we have we are pushing it to the limit because someone decides that they must charge 41 workers fighting to get their monies - that's how as simple as it is." "But would you agree that this could have been dealt in a more amicable way?" "Of course it can, but I don't think that the people involved want any want amicable solution. You have to understand what's happening here you know, these are BML workers, the longer you keep them in the system they can't work, that means less productivity in the company, this means less work for the company, the company is losing and if they have to come back again tomorrow it's a third day of lost for them. So you have to understand that this is a tactic to intimidate people from not taking to the streets and it is tactic of going after a company who you clearly have a fight. 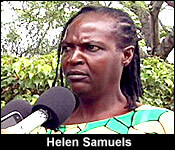 Amidst all of that I say the elephants are fighting and the grass are being trampled on - the grass are my clients." 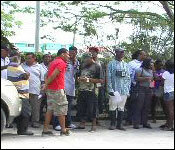 22 of the 41 BML workers were arraigned before 3 separate magistrates, and they were all granted bail. In addition to that charge, which they pleaded not guilty to, they were all fined $500 for the charge of littering, which they have 15 days to pay. They didn't have to be arraigned for that charge because it is treated a traffic ticket. If they default, there is an additional late fee of $130, and $30 for each day beyond the deadline. 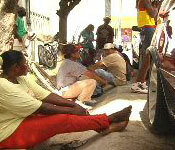 Importantly, the workers have been granted a permit to have legal protests on Thursday and Friday. "I came out there to do my work as a reporter for the Belize Times and Positive Vibes and that's what I was doing when I was hauled across the street by the police and say that I was loitering. No, that is foolishness." "We've made to understand that your personal camera the police officers have decided to delete all your pictures. Is that correct and what your reaction to that?" "Yeah, that is correct and I will see my attorney this morning and whatsoever the procedure is to make a formal complaint. 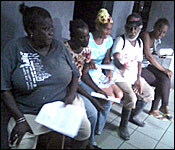 These are pictures that are to go in the Belize Times this weekend. I have no picture to give my editor." 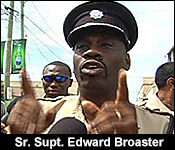 Senior Superintendent Broaster has denied deleting anything off Vaughan's phone or camera. 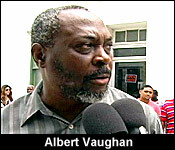 Immediately after his interview with us, Vaughan was called by a police court orderly to be arraigned, but at the advice of his attorney, he refused to present himself for the hearing, because his police bail noted that he was to report to court for the charge of loitering on Thursday, August 8. Immediately, you should recognize that this is an error, because this Thursday is August 7. Vaughan told us that he his attorney is trying to query if it's Thursday or Friday that police want him to report to Magistrate's Court to be arraigned. 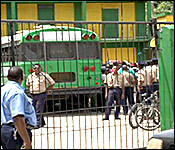 Reports from Belize City say that the police is suspending the process of bringing charges against the male workers of Belize Maintenance Limited who were arrested on Monday. According to information received, the decision to suspend charges at this time is because negotiations are ongoing. 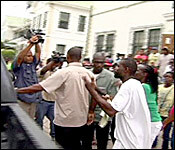 When those negotiations are completed, the police will determine whether to continue with the charges. It is not sure if the charges against the women who were arraigned on Tuesday will be suspended as well. The Government of Belize will pay he wages of the workers of Belize Maintenance Limited for the remaining life of the current sanitation contact with the Belize City Council. 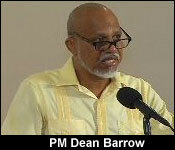 The announcement was made this afternoon by Prime Minister Dean Barrow during a press conference at the Biltmore Hotel. Prime Minister Barrow, in making the announcement, said that the decision to pay the wages for the BML workers is not a political gesture but a response to the situation facing them. The Prime Minister also announced that the Belize City Council has committed to taking on as many of the BML workers as is needed when the sanitation contract expires in Jaunary, 2015. What a difference a day has made for the 40 – plus BML employees. Yesterday, they were facing major fines and multiple criminal charges – ad tonight they are free and clear of those charges – and more than that they are going to be re-hired! How did all this happen so fast? Well there's no other way to say it, "Daddy Dean" stepped in to clean up the mess. "The other half of the BML workers who hadn't been arranged yesterday, showed up back to court answering their summons, readying themselves to face the charges laid against them. Their family, friends and persons who would sign for them sat down in the shade expecting that it would be another very long day in the sweltering heat, waiting for the magistrate's court to accommodate them. But an hour of so after they had reported to court news came down that the police senior command was in negotiations for all charges to be dropped, reportedly with some not so gentle prodding from central government." "His high commanding officer called in just a while ago and said that they are not going to proceed with any criminal charges at this time against the workers who took place in the mini protest in front of the city hall. So as of now he is saying that the workers can go home and if there is anything else if police decide after the negotiation that they will proceed, then the police will get in contact with us individually. So as of now you are all free to go until such time of negotiation with the higher people in charge. He did not mention anything about yesterday. 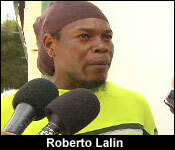 He said the workers who are out here with the sun being hot can leave, he got the word from his high command. 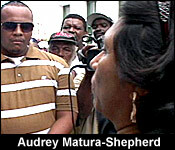 Audrey has been informed as well of the situation." 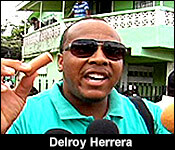 "You consider this a victory Delroy, for the workers?" "This is not a victory for the workers, this is a hump that has been jumped, and when you jump a hump there's road ahead, it's not a dead end. So what we will do here now is we will move and at 2 o'clock this afternoon the workers will organize again at B.M.L's office and then we will plan away forward since we have our permit. We will try to stay in the scope of the law this time." "Is this a signal that somebody in the upper chair is beginning to listen?" "Well, we hope. Like Mr. Lawrence said this morning, we hope that someone, that god touches somebody's heart or touches Darrell's heart in some way, somehow, some form. The situation is a dire that we are faced with right now. At this time for now we have word that yes, someone in high authority is sending down instructions to these officers, someone in high command is engaged in negotiation." "Do you expect the charged for everyone to be dropped?" "At this point I expect that all charges should be dropped against all these workers. The workers were just standing up for their rights and we will continue standing up for our rights until we get just the proper payment these workers want. They want a sense of comfort that they will have a job after January 2015 and if the council is not going to have a job for them, then the council needs to go back to a company who wants these people. You people are not wanted by the council, you people are not wanted by the government, and you are only wanted by B.M.L. 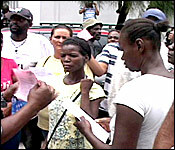 So if B.M.L wants you all then let us renegotiate the contract and give these people a fighting chance to make a living." "Those employees who had take a stand had been appeased, their voices were heard above the mayor's clinical explanation to why their services are obsolete and overpriced." "People think we are out there to affiliate ourselves as a political affiliation. This about no kind of politics, this is about just fighting for the rights of the workers and see what they can facilitate for the workers at the end of the day. Why I feel good is that at the end of the day, they dropped the charges. And for far we got to understand that it was somebody from higher authority listening and that is what I feel good for. " "We have a situation here where the prime minister has more sense than the council because they already see what is going no. If elections are coming and you are pressuring the people that are cleaning the city. Now brother, we have to take care of our family on 169 dollars. That is food, water, rent, cable because we are people too. Some of us don't have table, what you think of cable? They have everything in their house, now you will tell me, who are we to make these people treat us in these kind of sense? We are only human beings, you understand me? The feeling people you is to make this place turn to communist. 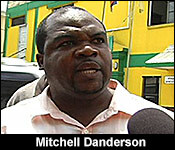 But like I said thank god, the prime minister intervene and looks he has more sense than the entire court house. He is instructing them that election is coming, because if the Belizean public could open their eyes they can plainly see what they are doing. They are victimizing us and they are brutalizing us, mentally, physically and spiritually, but they can't break our spirit." "Everybody feel happy now, we think we free to go and ready to jam again." "We will stand in solidarity to the end because bare the fact that these people think that this would have blown over like a little breeze. This won't blow over like a little breeze none at all." "School is opening, I can't even get a loan from my credit union because they will look at me and tell me those people are not even paying you, so what do they want us to do? We just stay here and just keep our mouth zip up like a zip lock bag? 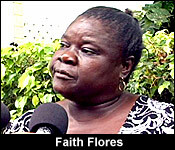 Come on man, it's only fair, we are Belizeans too. Not because we are not driving a Prado or a 2013 Rav 4 or whatever. We have kids to mine, we have bills to pay, and we are human beings. You know what is the worst thing? To feel less than a man that you can't take care of your family, how do you think they make us feel? Thank god, the prime minister looks like he has a heart." So, the police department has dropped the criminal charges against all the 41 workers, and the $500 for the littering ticket, well City Council has waived that, so none of the employees have to pay that fine – meaning, a clean slate. But what about their jobs? After all, that's what started this whole thing in the first place! Well, seems "Daddy Dean" has cooked up a solution to that too…. Prime Minister Dean Barrow hosted a press conference at 4:00 this afternoon to outline how his Administration would intervene into the BML/City Hall dispute to make things right going forward. 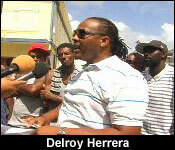 "An understanding was reached between government and B.M.L and between the Belize City council and B.M.L. Yesterday evening after I became aware of the details of the situation that saw the B.M.L engage in their protest action and after I had been acquainted back and forth between the Belize City council and B.M.L. I got in touch with Mr. Ellis who's the owner/manager of B.M.L and arranged for my representative in the person of economics affairs ambassador Mark Espat to sit with Mr. Ellis; to try and agree on the contours of the intervention that I have told Mr. Ellis government was prepared to make. Mr. Ellis and ambassador Espat did meet and that meeting resulted later on in the issuing of a letter on the part of the Government of Belize to Mr. Lawrence Ellis and Belize Maintenance Limited. What that letter does and I can read it in full for you if that appears to be necessary. 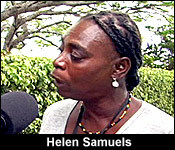 But in effect what the letter does is to commit the government of Belize to pay the weekly salary of the B.M.L workers. 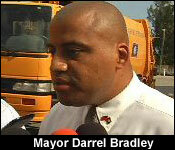 Government will do this right through to the end of the contract between B.M.L and the Belize City council. 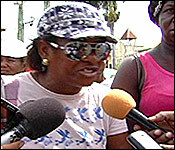 So we will assume the obligations of the Belize City council. Government has done this of course because there's no way we could not act in the face of a situation that saw workers either been having laid off or about to be laid off. For us this is not political, this is a matter of philosophical and deeply held conviction on the part of this government. I'm not going to comment in any judgmental way on the circumstances that produced a situation in which workers were either laid off or were in danger of being laid off; But this government knew, I certainly knew that we would have to find the money to ensure that these workers could continue being paid, well in fact employ the workers who's employment with B.M.L will of course come to an end if B.M.L no longer have the job of work that the contract provides for. So the commitment on the part of government is to pay the salaries through January 18th, whenever the contract expires and the city council in turn is committing to employing those workers to having them transition to the status of Belize City council employees. I spoke to senior super intendant Broaster, with respect to the charges that have already been proffered in some cases against the workers and he in term spoke to his superiors and the charging officer. There were some arraignments of workers on charges having to do with illegal assembly that had already taken place by the time I intervened with Mr. Broaster this morning. There were others to be arraigned today, as a consequence of our discussion and agreement those were not proceeded with, so we're only dealing with the 22 who were first arraigned yesterday, I believe their matter was adjourned to the 6th and 7th of October, 2014. As I said the others that were to be arraigned there was no lodging of the charges, so the assurance is that those charges will not now be lodged and so they don't have to worry. With respect to the first 22, the police will withdraw those charges, will indicate to the court it will not proceed with any prosecution of those charges." It is important to stress that the intervention from the Ministry of Finance will only cover a portion of the City Council's weekly bill to Belize Maintenance Limited. Central Government will only be paying $35,000 weekly for wages and wage related costs for the workers employed by BML. The City Council will have to find the rest. 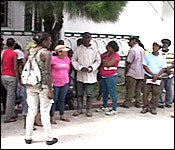 They will also be hired by the Belize City Council when the contract expires in January 2015. "The prime minister asked us to reconsider the charges on the individuals. Nevertheless, we sat down as a management team and decided that we will reconsider and we will discontinue the charges after we were requested to reconsider." "But sir couldn't that decision from the police high command happen before the prime minister decided that he would make an intervention?" "I would not agree with your comment at this time because when I went out there and I cautioned the people, I cautioned them 3 times. While we were not aware of any intelligence that this action would have taken place in front of the city council, we quickly got intelligence that when they left in front of the city council they were heading to Albert Street to do the same thing, hence the reason why we diverted them from going across the swing bridge into queen street and into the compound. We have to realize that we are the keepers of the law and when the law is broken, yes we have that ability to utilize our discretion and what have you but that discretion was exercised on the ground and we gave them ample opportunities to leave the area, pick up their garbage and they refuse to do that." So, as the criminal matters, the 22 who were arraigned yesterday, when their case goes back to court on October 6 and 7, the police prosecutors in charge of their cases will make a formal application before the sitting magistrates to withdraw the charge of taking part in an unlawful gathering. The others who were to be arraigned today, though they were formally charged, the cases will not be lodged at court, and they will be withdrawn. So, as we've reported, all charges will be dropped, and the ticket fines for littering will be waived, which means that the workers aren't expected to pay that $500. But yesterday, Mayor Darrell Bradley flatly rejected the idea of doing what the Prime Minister announced that the City Council intended to do. During that interview, when the angry BML workers swarmed him demanding that he speak to them face to face, he was asked that question. "Will you strike off the tickets for littering? Will you continue fining them at 500 dollars each?" "As a matter of policy and politics, I put a policy in relation to this. I have made a policy at city council that when a person is issued a ticket that's a ticket that is issued by our staff for an infraction. No political person gets involved with that. When we have parking tickets that are issued, no councilor can get involved in that, just like how the police process is there, that's an administration function. If a person has been ticketed, I saw the reels in terms of the trash that was laid out there. Those tickets have been issued, there is a certain process that deals with that and if they think that ticket was unfairly issued then they should deal with that." "The position is after reflecting a lot no this matter, I think that the workers ought not to be victims in these circumstances. 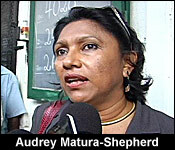 I think that Audrey Matura said something yesterday on the news which spoke to me. She said that when elephants fight it's often times that they trample on grass. I thought that was not a nice way to describe people being trampled on, and when I saw the images last night on the news of people being incarcerated. I'm a human being and those things speak to be as a human being and I think that in retrospect things could have been different in the entire circumstance and we took a decision to withdraw as it related to that aspect of it that has to do with the city council. Which is the issuance of the littering fines, which are these 500 dollar tickets, all of that will be withdrawn and I understand from the prime minister that they will also ask for the police aspect of it to also be withdrawn." "When this question was put to you yesterday, your position at the time was a complete no, in relation to the tickets. You said that this is policy, you don't influence the retraction of such things because of politics, and this seems to be a reversal of your position"
"Well, one of the things that I will say is that leader can never be inflexible, leadership always has to bend and you have to be reflective on your individual conduct. One of the things that moved me as I indicated is seeing the images of the people incarcerated. 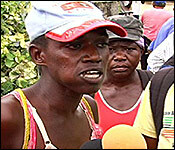 These are people who for want of their jobs are put in a very difficult situation." "How influential was the intervention from the prime minister in reversing this position because our sources say that it came from the prime minister originally. Then it caught traction with the city council." "Well I think that the prime minister is always a significant act, if the prime minister calls me, I'll jump. If the prime minister who has been very generous in our infrastructure projects indicates to me that his position is that he is prepared to assist the municipality with meeting financial obligations of this contract, we don't have a problem with that. That's something we welcome, we have to welcome, and this is the leader of our country. Clearly in retrospect and reflecting on my own conduct, I have to say that there are certain things that have unfolded over the last couple days which I find unfortunate, which I find I have some culpability in, which I would have liked to be different." "Did you have to pull rank as prime minister, the leader of the nation to get this change in position?" "No sir, the short answer is no. When I met with the mayor and the council this morning, in going over what had happen up to that point, I informed them that after speaking with senior super intendant Broaster and the police; Those charges were going to be withdrawn and immediately and the mayor said the same thing is going to happen with respect to the tickets."